This is for one (1) quality marine grade stainless steel (AISI 316) bow shackle. Each shackle is stamped 316 and 12mm. 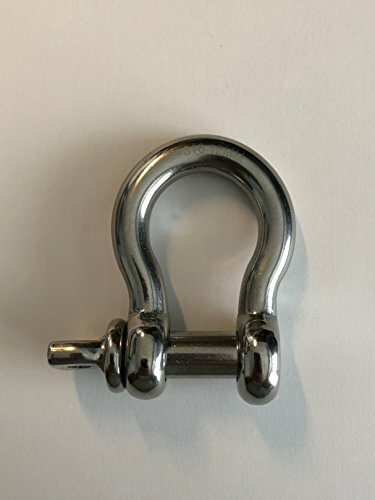 The shackles are marked in the metric specification style of 12mm (for the pin size), but these bow shackles are made in the US Type style of an oversize pin. The Imperial equivalent is generally considered to be 7/16". The pin diameter dictates the size of the US type bow shackle, so in the US Type style this is a 7/16" body (the pin is 1/2" or 12mm). Some manufacturers call this an oversize pin. Not to be used for overhead lifting. AISI 316 stainless is a premium grade of stainless and is considered by many to be best in class. 316 stainless is corrosion resistant and very durable even in the harshest of conditions. Pin diameter- 1/2" , Body diameter- 7/16"